Mark Cantabury (as Shanghai Pearce) teamed with Dennis Knight (as Tex Slazenger) in WCW as a masked tag team..
Henry O. Godwinn (Mark) started out as a heel singles wrestler for a few months before turning babyface against Ted DiBiase..
Henry O. Godwinn was later joined by his cousin, Phinias I. Godwinn (Dennis Knight) and they formed a babyface tag team..
January 29, 1996 – RAW: The Godwinns (Henry O & Phinneas I) defeated The BodyDonnas (Skip & Zip)..
February 18, 1996–In Your House 6: The Godwinns (Henry & Phinias) defeated The Bodydonnas (Skip & Zip)..
March 11, 1996 – RAW: The Godwinns (Henry O & Phinneas I) defeated Jerry Meade & Alex Porteau..
March 31, 1996–WrestleMania 12: The Bodydonnas defeated The Godwinns to win the vacant WWF Tag Team titles..
April 22, 1996 – RAW: The Godwinns (Henry O & Phinneas I) defeated Yoshihiro Tajiri & Ken Patterson..
April 28, 1996–In Your House 7: The Bodydonnas defeated The Godwinns to retain the WWF Tag Team titles..
April 29, 1996 – RAW: The New Rockers (Marty Jannetty & Lief Cassidy) vs. 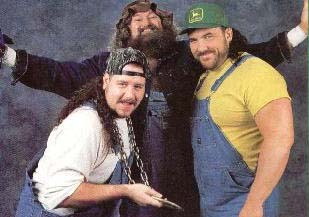 The Godwinns ended in a Double Countout..
May 19, 1996: The Godwinn Cousins defeated The Bodydonnas (Skip & Zip) to capture the WWF Tag Team titles..
May 26, 1996–In Your House 8: The Smoking Gunns defeated The Godwinns to win the WWF Tag Team titles..
June 3, 1996 – RAW: The Godwinns (Henry O & Phinneas I) defeated Techno Team 2000 (Travis & Troy)..
June 23, 1996–King of the Ring: The Smoking Gunns defeated The Godwinns to retain the WWF Tag Team titles..
July 8, 1996 – RAW: The British Bulldog & Vader defeated The Godwinns (Henry O & Phinneas I)..
July 21, 1996–In Your House 9: Mankind defeated Henry O. Godwinn..
July 29, 1996 – RAW: The British Bulldog defeated Henry O. Godwinn..
August 12, 1996 – RAW: The Godwinns defeated T.L. Hopper & Who (Jim Neidhart under mask)..
August 18, 1996–SummerSlam: The Gunns w/Sunny beat The Godwinns and The Bodydonnas and The Rockers..
August 24, 1996–WWF Xperience: The Godwinns defeated The New Rockers (Marty Jannetty & Leif Cassidy)..
September 30, 1996 – RAW: The Godwinns defeated The Grimm Twins (Jason & Jared)..
October 20, 1996–In Your House 11: The Godwinn Cousins defeated The NEW Rockers in a dark match..
October 21, 1996 – RAW: The Godwinns w/Hillbilly Jim defeated The Smoking Gunns (Billy & Bart Gunn)..
November 16, 1996–Survivor Series: The Godwinns & Furnas & Lafon beat Owen Hart & The Bulldog & The Rockers..
December 16, 1996 – RAW: Fake Diesel & Fake Razor Ramon defeated The Godwinns (Henry O & Phinneas I)..
January 19, 1997–Royal Rumble: Henry Godwinn enters the Rumble at #29 but was eliminated by The Undertaker..
January 27, 1997 – RAW: The Godwinns (Henry O. & Phinneas I.) defeated Vader & Mankind by Count Out..
February 16, 1997–In Your House 13: The Godwinns defeated The Headbangers (Mosh & Thrasher)..
February 24, 1997 – RAW: The New Blackjacks (Bradshaw & Windham) defeated The Godwinns (Henry O. & Phinneas I.).. March 23, 1997–WrestleMania 13: The Headbangers beat The Godwinns and The Blackjacks and Furnas & LaFon..
April 7, 1997 – RAW: The British Bulldog & Owen Hart defeated The Godwinns to retain the Tag Team titles..
April 14, 1997 – RAW: The Godwinns (Henry O. & Phinneas I.) defeated Legion of Doom (Hawk & Animal)..
April 20, 1997–In Your House 14: Doug Furnas & Phil LaFon defeated The Godwinn Cousins..
June 23, 1997 – RAW: Legion of Doom (Hawk & Animal) defeated The Godwinns (Henry O. & Phinneas I.).. July 6, 1997–In Your House 16: The Godwinns defeated The BlackJacks (Blackjack Bradshaw & Windham)..
July 28, 1997 – RAW: The Godwinns defeated Steve Austin & Dude Love (Tag Team Champions) by Count Out..
August 3, 1997–SummerSlam: The Legion of Doom (Hawk & Animal) defeated The Godwinn Cousins..
August 4, 1997 – RAW: The Godwinns (Henry O. & Phinneas I.) defeated The Headbangers (Mosh & Thrasher)..
August 11, 1997 – RAW: Legion of Doom member Hawk defeated Henry O. Godwinn..
September 7, 1997–Ground Zero: The Headbangers defeated Owen/Bulldog and Legion of Doom and The Godwinns..
September 8, 1997 – RAW: The Headbangers (Mosh & Thrasher) defeated The Godwinns to retain the Tag Team titles..
September 20, 1997–One Night Only: The Legion of Doom defeated The Godwinns..
October 5, 1997–Bad Blood: The Godwinn Cousins defeated The Headbangers to win the WWF Tag Team titles! October 6, 1997 – RAW: The Headbangers (Mosh & Thrasher) defeated The Godwinns in a Lumberjack non-title match..
October 13, 1997 – RAW: Legion of Doom (Hawk & Animal) defeated The Godwinns to win the WWF Tag Team Titles..
October 20, 1997 – RAW: The Godwinns vs. The Disciples of Apocalypse (Skull & 8-Ball) ended in a No Contest..
November 9, 1997–Survivor Series: The New Age Outlaws & The Godwinns defeated The Headbangers & The Blackjacks..
December 8, 1997 – RAW: Legion of Doom (Hawk & Animal) vs. The Godwinn Cousins ended in a No Contest..
December 22, 1997 – RAW: The Headbangers (Mosh & Thrasher) defeated The Godwinns (Henry O. & Phinneas I.) by disqualification..
January 12, 1998 – RAW: The New Age Outlaws defeated The Headbangers and The Godwinns and The Truth Commission..
January 18, 1998–Royal Rumble: Henry Godwinn entered the Rumble at #25 but was eliminated by Faarooq..
January 19, 1998 – RAW: The New Age Outlaws (Roaddog & Billy Gunn) beat The Godwinns to retain the Tag Team titles..
February 15, 1998–No Way Out: The Godwinn Cousins defeated The Quebecers (Jacques Rougeau & Pierre Ouellet)..
March 29, 1998–WrestleMania 14: The Godwinn Cousins participated in a Tag Team Battle Royal (won by LOD 2000)..
April 4, 1998–Mayhem in Manchester: The Godwinn Cousins defeated Skull & 8-Ball in a Tag Team Strap match..
August 10, 1998 – RAW: Southern Justice vs Animal & Darren Drozdov ended in a no contest..
August 24, 1998 – RAW: The New Age Outlaws defeated Southern Justice..
August 31, 1998 – RAW: Southern Justice defeated The Headbangers..
September 7, 1998 – RAW: Southern Justice defeated Too Cool..
September 21, 1998 – RAW: Southern Justice vs The Disciples Of Apocalypse ended in a No Contest.. The Godwinns had a match with LOD 2000, where Henry O. was hit with the Doomsday Device, resulting in a broken neck! The Godwinns returned and dropped the “hillbilly” gimmick, and become known as Southern Justice, bodyguards for Tennessee Lee..